Good morning and thank you for having me on Just Romantic Suspense once again. Today, I’d like to talk about Fire Angel, my first romantic suspense novel, released on April 29, 2013. It’s been a year, and what an incredible journey it’s been. 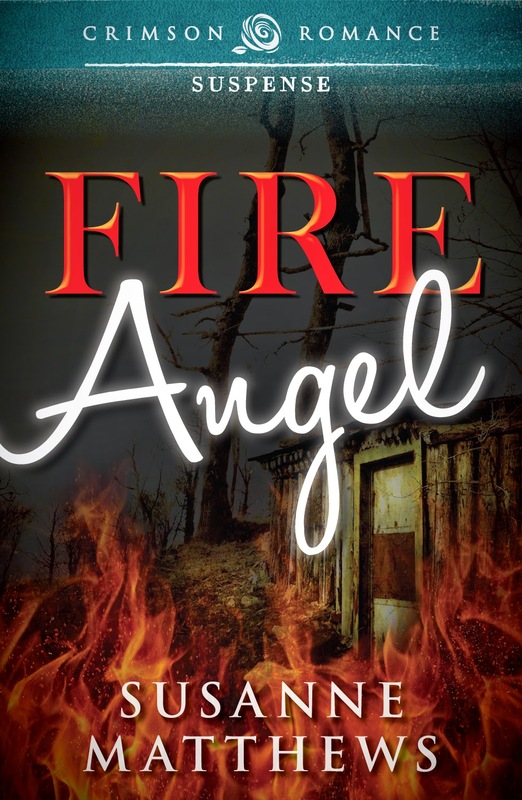 The main characters in Fire Angel are Alexis, a feisty fire investigator with a knack for solving the tough cases, Jake, a disabled veteran criminal profiler who doubts his ability to be as good as he used to be, and the Fire Angel, a serial arsonist bent on revenge against the people of Paradise. These characters are as real to me as any of the people I know in my everyday life—maybe even more so, because I controlled their thoughts, actions, and adventures. In many ways, being an author makes me feel a little god-like, as in the ancient gods of Greece who meddled in the lives of humanity. I created the setting for the story—a small town in Northern Ontario because I wanted to share the love I have for the incredible scenery that can be found in Canada. I used typical fall-winter weather to my advantage, and since we’d had a blue moon that year, I dragged it into the story too. I populated Paradise with everyday people some with secrets, others who were exactly what they seemed to be. My characters weren’t perfect; they were flawed, and all too human. As in the Garden of Eden, there’s a snake in my Paradise, an insidious creature bent on death and destruction. As I wove the threads of their lives, I felt like a puppet master, pulling their strings to make them act out my story. I researched every aspect of fire and fire investigation as well as extra-sensory perception. When I finished, I was proud of myself and my characters, but unlike God on the seventh day, I didn’t rest. Writing the book was only the beginning. As much as love being an author, there’s a part of me that’s as insecure as it can possibly get. My story was loosely based on a series of disconnected events occurring in and around the city where I live. Part of me was terrified at the prospect of being judged by the reading public. Was the plot strong enough? Had I developed believable characters? Was the dialogue quick-paced and natural? Writing the book was a challenge, but sending it to a publisher was the real leap of faith. Will they like it? Will they want it? I agonized for several weeks until the email came offering me a contract for the book. Three rounds of edits by people far more knowledgeable with the needs of the publishing industry produced the final product, and to this day, I’m still somewhat in awe of it. I’m as proud of Fire Angel as I can be. While reviews on Amazon, Goodreads, Barnes & Nobles, and similar places are critical to a book’s success, the reality is people read books and don’t review. My greatest satisfaction comes from hearing someone I know tell me how much they enjoyed the story. Being told they couldn’t put the book down is an incredible thrill that makes all the blood, sweat, and tears that go into writing a novel worthwhile. Fire Angel is my first-born brain child, and it taught me many things. This year has been an emotionally exhausting one, with ups and downs, joy and heartache, but the sense of pride I have each time I look at my beautiful cover I remember the thrill of it all. A malicious serial killer is out for revenge in Paradise. Using fire as his weapon, he strikes at random, and the bodies are piling up. Criminal profiler Jake McKenzie has returned from Afghanistan minus a leg and afraid to trust his instincts. When the police ask for his expertise in identifying the killer, he agrees knowing this is his chance to prove he can still do the job. Sixteen years ago, fiercely independent Alexis Michaels escaped an abusive uncle and a deadly fire to become one of the country’s top fire and arson investigators. Her uncanny ability to put herself in the arsonist’s place is the skill they need to find this maniac. She reluctantly accepts the assignment and returns home to lead the hunt for the killer, knowing she will have to confront the unpleasant memories. When Jake discovers that his new partner is the girl who haunted his dreams all these years, he finds himself enthralled, but memories of his dead wife make him doubt his emotions. Alexis has few pleasant memories of Paradise, but Jake is one of them. Undeniably drawn to him, she longs for a deeper relationship but believes he isn’t ready to move on yet. Until they catch the killer, they must set aside their conflicted emotions and work together. The clock is ticking, and the killer has made it clear: Alexis is next. “So when the rental agency gets the car back, they can say the finger grooves in the steering wheel are for improved navigation control.” She chuckled. “I don’t think they’ll be open to returning my security deposit though.” She reached for her beer and took a drink. She had changed, and he found the change very appealing. She had been more beautiful in her indignation than anyone could have imagined, her eyes flashing fire and growing more compelling for it. Her sense of humor relating the story of her encounter with the moose showed her courage and determination; it was nice to find a woman with a backbone, but whether she liked it or not, he would watch that backbone for her. The memory of a woman who allowed others to brainwash her into doing what they wanted flashed through his mind, but Alexis’ presence and her question didn’t allow it to take root. “What do you mean by that? I’m a fire investigator, not a forensic anthropologist.” She scowled. Fire Angel sounds interesting! Can't wait to check it out! Intriguing plot and can't wait to find out more about the characters!